For those patients that have lost all or some of their teeth, we have good news. Dr. Sadr has specialized training in fabricating well fitting, good quality dentures and partials. Dr. Sadr uses the natural anatomy of your mouth to shape the denture and partial to the desired size and fit. She sometimes recommends implants to stabilize your denture or partial. There are various types of complete dentures; conventional dentures, immediate dentures and implant supported/retained dentures. A conventional denture is made after the remaining teeth are removed. An immediate denture is placed on the same visit that the teeth are removed. With immediate denture, the denture wearer does not have to be without teeth during the healing period. 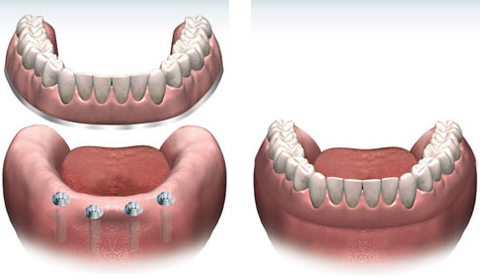 Implant supported/retained denture is a fixed or removable denture over dental implants. It gives the individual greater chewing ability and retention and feels more stable in the mouth. Please call our office for a denture or implant consultation if you think that you may need a denture or partial. An implant supported denture provides a better bite and is more stable.